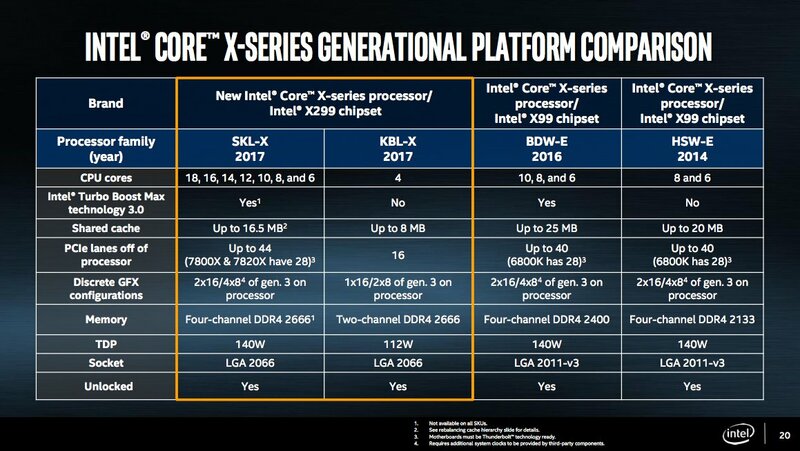 It’s the flagship model among Intel’s new X-Series chips. Last year at Computex, Intel unveiled its first 10-core consumer CPU, the company's move into the world of a "megatasking." It was a pricey chip, launching at around $1,700, but it satisfied users who needed to juggle several intensive tasks at once. 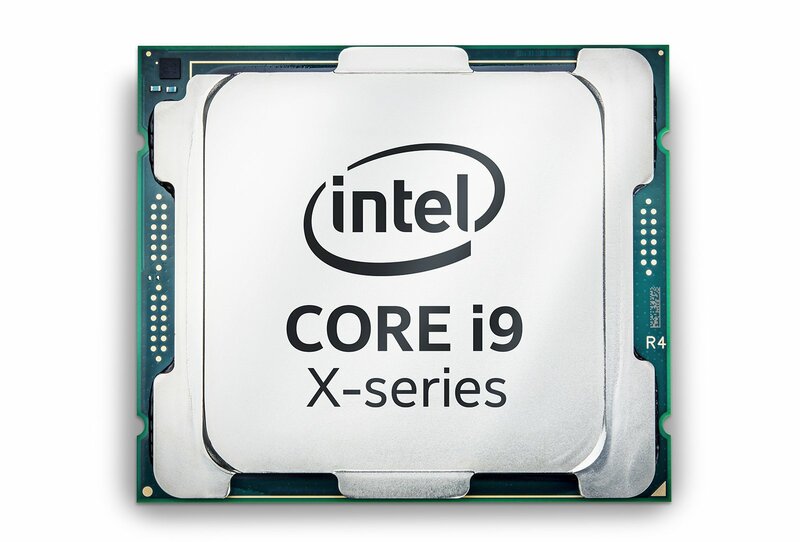 Now, Intel is upping the ante with a new family of processors for enthusiasts, the Core X-series and it's anchored by the company's first 18-core CPU, the i9-7980XE. Priced at $1,999, the 7980XE is clearly not a chip you'll see in an average desktop. Instead, it's more of a statement from Intel. It beats out AMD's 16-core Threadripper CPU, which was slated to be that company's most powerful consumer processor for 2017. And it gives Intel yet another way to satisfy the demands of power-hungry users who might want to do things like play games in 4K while broadcasting them in HD over Twitch. 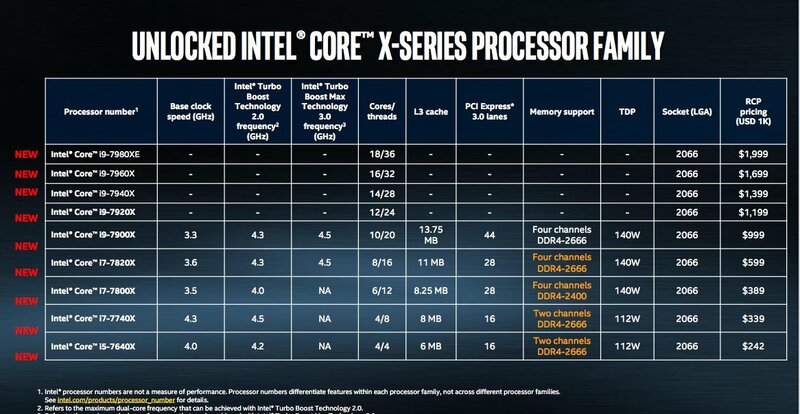 And, as if its massive core count wasn't enough, the i9-7980XE is also the first Intel consumer chip that packs in over a teraflop's worth of computing power. If 18 cores is a bit too rich for you, Intel also has other Core i9 Extreme Edition chips in 10-, 12-, 14- and 16-core variants. Perhaps the best news for hardware geeks: The 10 core i9-7900X will retail for $999, a significant discount from last year's version. All of the i9 chips feature base clock speeds of 3.3GHz, reaching up to 4.3GHz dual-core speeds with Turbo Boost 2.0 and 4.5GHz with Turbo Boost 3.0. And speaking of Turbo Boost 3.0, its performance has also been improved in the new Extreme Edition chips to increase both single and dual-core speeds. Rounding out the X-Series family are the quad-core i5-7640X and i7 models in 4-, 6- and 8-core models. While it might all seem like overkill, Intel says its Core i9 lineup was driven by the surprising demand for last year's 10-core chip. "Broadwell-E was kind of an experiment," an Intel spokesperson told Engadget. "It sold ... proving that our enthusiast community will go after the best of the best. ... Yes, we're adding higher core count, but we're also introducing lower core counts. Scalability on both ends is what we went after." As you can imagine, stuffing more cores into a processor leads to some significant heat issues. For that reason, Intel developed its own liquid cooling solution, which will work across these new chips, as well as some previous generations. All of the new Core i9 processors, along with the 6- and 8-core i7 chips, feature scorching hot 140W thermal design points (TDPs), the maximum amount of power that they'll draw. That's the same as last year's 10-core CPU, but it's still well above the 91W TDP from Intel's more affordable i7-7700K. Over the past few years, Intel's laptop chips have been far more interesting than its desktop CPUs. Partially, that's because the rise of ultraportables and convertible laptops have shifted its focus away from delivering as much computing power as possible to offering a reasonable amount of processing power efficiently. The new Core i9 X-series processors might not be feasible for most consumers, but for the hardware geeks who treat their rigs like hot rods, they're a dream come true.